Coconut cake, what could be any better on a cold winter’s day? 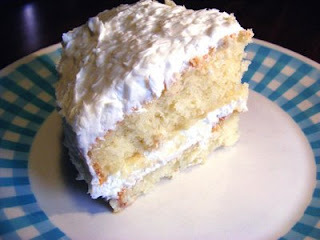 Coconut cake makes me think of spring. I had a friend in school whose mother made a coconut cake every spring in the shape of a bunny rabbit. I thought this girl had the best mom in the world just because she made this cake and had fried French fries from a bag. Okay I was easily impressed. My mom did not fry french fries from a bag she made homemade steak fries and she NEVER made a cake in the shape of a bunny rabbit. Although she did buy some fabulous cakes when I was growing up. This recipe is a little complicated but so worth the effort. I hope you will give it a try very soon! Sift flour, baking soda, baking powder, and salt together. Mix in a stand up mixer eggs and sugar until creamy at this time add butter, vanilla, and coconut milk. Now is the time to gently mix in the flour mixture a cup at a time. When all is mixed in fold in the coconut. Bake in 2 –8 inch round cake pans. Cook for 20-25 minutes at 350’. Be careful not to over cook cakes. When they turn golden remove from oven and place on a cooling rack. Cook completely. Remove from pans and slice in half so you will have 4 layers of cake. I was going to do this but Raven took the cakes out of the pans a little to early and one cracked. Could not get upset with her she was helping me out. Raven likes to cook and how sad would it be to discourage her by getting upset. So I have a 2-layer cake. Eats the same. Place cream cheese, butter and vanilla in a stand mixer and mix until completely mixed. Meaning they are smooth. Now is the time to add powder sugar a cup at a time until very thick. Add cream ¼ cup at a time. Mix well. You will most likely need to add more powder sugar at this time. You will have a total of ½ cups of cream in the icing total. I do it ¼ cup intervals because I think it mixes better with the powder sugar. Make sense?? I use almost all of the powder sugar give or take a cup. You know how icing should feel. Thick but not too thick. If it is too thick it will tear your cake and if it is too thin it will run off of your cake. Both not good. When your icing feels like it will spread well fold in the coconut. Ice each layer of your cake whether it is a four or two layer. We like a lot of icing so we go heavier on the top of the cake.